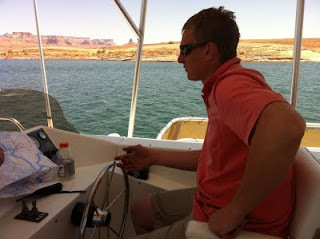 Here's the guy I went to Lake Powell with this month--I think I'm in LOVE! Did I mention that I've been married to him for 13 years? Okay, I'll admit that I love him (a lot). These days, life around here is all about process. For example, it is about getting everyone and everything into the car without breakdowns or break-outs. It's about getting people fed or bathed. It's about learning not to freak out at the prospect of cleaning up a room. Any number of things can pose obstacles to these simple tasks: Poo, injuries, insults, hunger, thirst, distraction, clothing... all of these things can and do complicate life. Every day, I wake up with a very simple mental list of things I would like to get done, and I work towards that. On my list are things like making beds, reading, doing dishes, making dinner, going to Lucy's Gymnastics class. All very ho hum. But don't let it fool you, it can be very exciting! Today, Lucy pulled a WWF move on Gabe and (from what I gather) slammed his face into the kitchen counter. Why? Well, short story: She was defending herself. Long story: Gabe requested noodles for lunch. I made noodles for him and for Lucy. After I put the bowls of noodles on the counter and Lucy started to eat hers, Gabe became convinced that Lucy was eating his bowl of noodles and attacked her. He got an ugly goose egg between the eyes and very apologetic sister in return. She even got him a bag of ice. It took him about five minutes to get over it, then he ate his noodles happily beside Lucy. So, although our lives are pretty simple right now, it doesn't mean things are always simple. One of my biggest challenges right now is the interaction between Gabe and Lucy. Gabe is tricky. He is busy being independent and taking offense. Lucy has a tendency to set him off by saying or doing something innocently (most of the time it's innocent, anyway). Gabe refuses or protests what Lucy does or says or offers and, in his frustration hurts Lucy by hitting her, biting her, or pushing her. So, it's tricky because it's not her fault that Gabe hurts her, and yet she could prevent it a lot of times by listening to and respecting her 2 year old brother. What to do? I try to tell Gabe that it's not nice to hit. I tell Lucy that she needs to work on listening to Gabe (he usually says "no" or "don't" before he hurts her), and respond to him like a five year-old, not like a two year-old. We often walk through scenarios after the dust is settled to find a better way to do things. This leaves me satisfied with the resolution most of the time, but won't be surprised if my methods leave them with some sort of scarring that I can't predict. Something else that drives Gabe to violence (okay, I better re-word that...he just gets a little rough-n-tumble): other family members are too involved with something else (a game, a book, a discussion, a craft) to give him attention. He wants to wrestle or fight, not just watch someone else do something. His solution: get your attention by attacking. 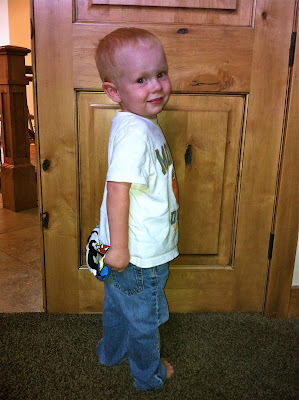 This past week, we have been dealing with pink eye and potty training. When we quarantined ourselves for conjunctivitis, I figured we might as well have a potty party. To kick it off in style, I rented some superhero DVDs and showed them to Gabe. He had been avoiding the potty for a while, but dropped his pants and diaper gladly to watch Superman and Lightning Lad and Saturn Girl. (Lucy didn't complain either.) 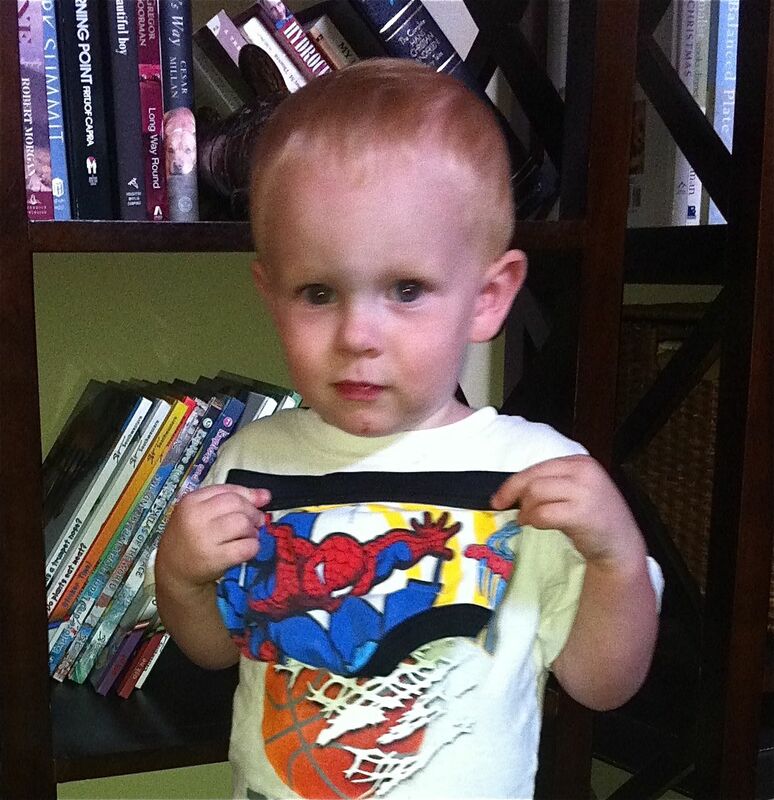 Gabe also pottied through The Incredibles and Mickey Mouse Clubhouse. I am a little reluctant to actually type this out, but I think Gabe is actually potty trained. He has been taking himself to the bathroom for the past few days. There are still accidents, and sometimes he wants to wear a diaper instead of his new Spiderman Underpants, but there is a DEFINITE trend. *Note to self: do not underestimate the power of a toddler being able to choose his or her own bathroom accessories at the store. Gabe got new underwear and a new potty seat. My greatest joys these days are as simple as my challenges. A little man making a beeline to the bathroom to get his own bum on a toilet, or his fierce hug and sincere "I wuv you, Mom." The light in Lucy's eyes when she finishes reading a book all by herself or how she confidently cares for her brothers. Connecting with the awesome person-in-miniature that is Charlie or just holding his perfect little body as he sleeps.